Controls plug-in parameters and automation. Outputs the value of the knob. Left / Cent switch: in left state the know displays the values as a range from it's minimum position to the actual value. In cent state the knob displays the value only. Anlg / Step switch: an Anlg state turning the knob is continuous, while in step state the knob turns with specified increments. 1st field below the knob: sets the minimum value of the knob. 2nd field below the knob: sets the maximum value of the knob. 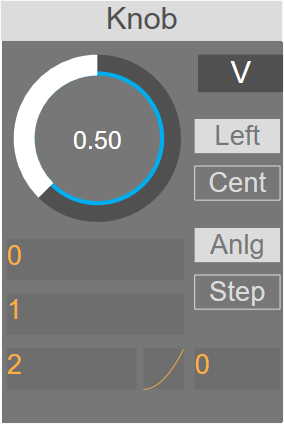 3rd field below the knob: sets the step resolution. If the Anlg / Step switch is in Anlg state, this field sets the steepnes of the knob, while in Step state this sets the difference between increments. Bottom right field: sets the VST parameter automation index. This index tells the host the order of the VST parameter. If this value is 0, the knob is not published for automation. A value above 0 turns the knob color to green, and the knob will be available as an automation parameter.